After 50 years, the U.S. has restored ties with Cuba. US companies are queuing up as the president moves to ease restrictions on travel and trade, raising hopes of warmer relations and an end to the embargo. ...The White House has moved to ease some travel and trade restrictions as a cautious first step towards better ties with Havana, raising hopes of an eventual lifting of the four-decade-old economic embargo. Several Bush-era controls are expected to be relaxed in the run-up to next month's Summit of the Americas in Trinidad and Tobago to gild the president's regional debut and signal a new era of "Yankee" cooperation. Could Miami's "Little Havana" Turn To Obama? Miami's large Cuban population, often referred to as "Little Havana" has always been predominantly Republican. Sunday's New York Times Magazine has a five page article questioning whether Cuban support in Miami might shift and vote Democratic in November. Primarily it examines some Democratic challenges to traditionally Republican House seats in Florida, But it also touches on the Presidential election. Backstage, something very new is happening. Call it the Miami Spring, or Cuban-American glasnost. This community that has clung for decades to its certainties — about the island itself, about the role the exile community would play after the Castro brothers passed from the scene, about where Cuban-Americans should situate themselves in terms of U.S. domestic politics — is in ferment. 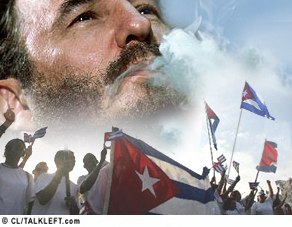 This matters not only in terms of the destiny of the Cuban-American community itself but also in terms of the 2008 elections since, despite claims made on background by some of Barack Obama’s advisers, Florida is likely to play a pivotal role in determining whether Obama or John McCain becomes president, and the Cuban-American vote is likely to play its usual outsize role in deciding which candidate prevails in the state. Fidel Castro has written an op-ed in Cuba's state-run newspapers today criticizing Barack Obama for saying he planned to uphold the embargo against Cuba while easing restrictions on Cuban residents in the U.S. from visiting and sending money to their relatives on the island. "Obama's speech can be translated as a formula for hunger for the country," Castro wrote, referring to Obama's remarks last week to the influential Cuban American National Foundation in Miami.....Castro said Obama's proposals for letting well-off Cuban Americans help poorer relatives on the island amounted to "propaganda for consumerism and a way of life that is unsustainable." He complained that Obama's description of Cuba as "undemocratic" and "lacking in respect for liberty and human rights" was the same argument previous U.S. administrations "have used to justify their crimes against our homeland." Barack Obama is still in Florida. Today, he spoke at a luncheon for the largest organization of Cuban-American exiles -- a pretty conservative bunch. He told them he would meet with Cuba's new leaders. The annual Cuban Independence Day banquet of the Cuban American National Foundation cheered Obama's avowed commitment to fostering democracy in Cuba. But the audience showed its wariness of his talk of meeting with Cuban leaders. Mere handfuls applauded that statement from among the crowd of at least 500. ....Foundation Chairman Jorge Mas Santos voiced the Cuban American community's enduring opposition to any U.S. president meeting with the Castro regime before political prisoners are released and free elections slated. The son of the foundation's late founder, Mas described any expectation of engaging Raul Castro in democratic reforms as "wishful thinking." Did he win himself any votes today? He did say he would end the travel restrictions and limits on sending money home, but he would also maintain the embargo. Kudos to both Hillary Clinton and Barack Obama (and even John McCain) for calling for Cuba to release all political prisoners in the wake of Castro's resignation. The people of Cuba yearn for the opportunity to get out from under the weight of this authoritarian regime, which has held back 11 million talented and hardworking citizens of the Americas. The new government should take this opportunity to release political prisoners and to take serious steps towards democracy that give their people a real voice in their government. "The prompt release of all prisoners of conscience wrongly jailed for standing up for the basic freedoms too long denied to the Cuban people would mark an important break with the past. It's time for these heroes to be released." "We must press the Cuban regime to release all political prisoners unconditionally, to legalize all political parties, labor unions and free media, and to schedule internationally monitored elections," the Arizona senator said in a statement.